* For the full fee schedule, card limits, and terms and conditions call 1-800-VARO-526 or visit the Varo Money website. ** Faster access to funds is based on comparison of traditional banking policies and deposit of paper checks from employers and government agencies versus deposits made electronically. Direct Deposit and earlier availability of funds is subject to payer’s support of the feature and timing of payer’s funding. ‍Bank Account Services provided by The Bancorp Bank, Member FDIC, and is insured to at least $250,000. 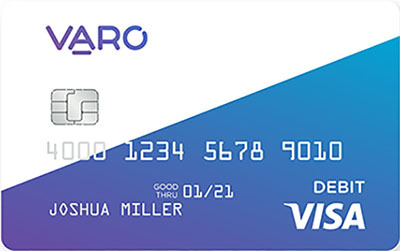 The Varo Visa Debit Card is issued by The Bancorp Bank pursuant to a license from Visa U.S.A. Inc and may be used everywhere Visa debit cards are accepted. All text and pictures on this page copyright Varo Money, Inc.